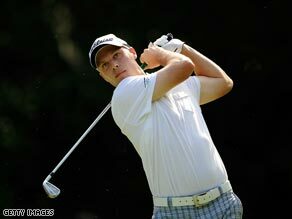 (CNN) -- Ben Crane led the way after the first day of the Players Championship with a superb seven-under-par 65 as he holed a string of birdie putts at Sawgrass. Crane plays his tee shot on the 8th at Sawgrass on the way to a 65. But world number one Tiger Woods struggled on the greens to be off the pace with a one-under 71. "I didn't hit good putts," a frustrated Woods told Press Association. "My speed was off early, then I got my speed down at the end and I kept lipping out putts. "I just need to obviously read them better or hit better putts, one of the two." Fellow American Crane needed just 22 putts as he headed John Malllinger, Alex Cejka of Germany and Swede Richard Johnson by a shot. "This is definitely one of the best putting rounds of my career," Crane said. In-form Englishman Ian Poulter was part of an eight-man group on five under alongside Retief Goosen of South Africa, Camilo Villegas of Colombia and home players Brad Adamonis, Scott Verplank, David Toms, Bubba Watson and Jonathan Byrd. Defending champion Sergio Garcia was three under par through the turn, but a double bogey left him tied with Woods on 71, the same mark as Fiji's Vijay Singh. World number two Phil Mickelson suffered a disappointing opening in Florida with a one over 73. The $9.5 tournament attracts arguably the strongest field in professional golf and is dubbed the "fifth major" as the elite tackle the testing Players Stadium Course with the short 17th, surrounded by water, the signature hole.